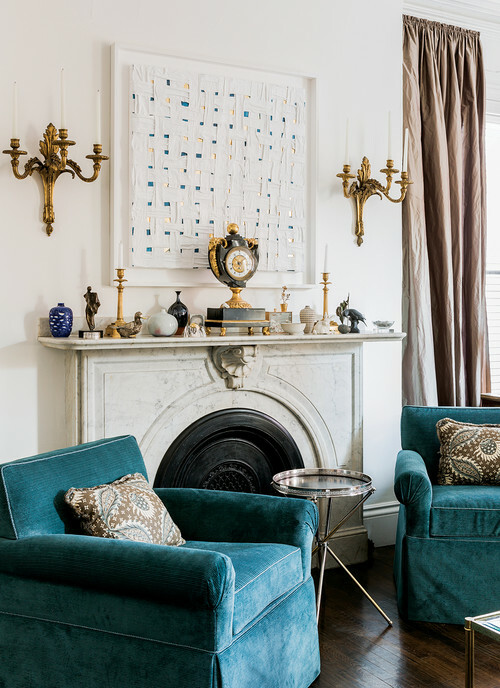 Over the weekend, I stumbled upon this fabulous Boston apartment, it is not the style I usually post on my blog, however I found the overall design so delightful and different, I had to share. The interior design is by Boston based, F D Hodge Interiors. White walls are juxtaposed against the dark wood floors and antique wood furniture, this gives it a slightly more modern look. I absolutely adore the 19th Century rosewood sideboard, above, the beautiful wood grain and unusual star burst doors make it very different than anything I have seen before. The statue of Apollo is a grand gesture for what appears to be a gracious apartment. Look carefully at the images as you will find some treasures in the detail the designer has incorporated. Clever mix of pattern, such as the backs of the dining room chairs and the wooden orb. 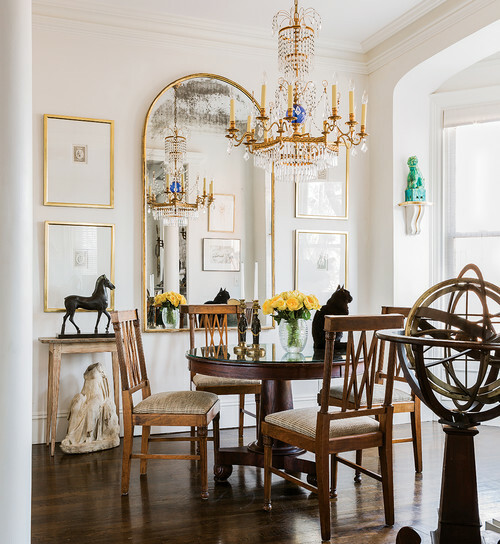 The tiny ball feet on the base of the dining room chairs, mirror the shape of the larger balls on the pedestal table. The chandelier suspended above the dining table is delicate and perfectly suited, neither dominating or understated. 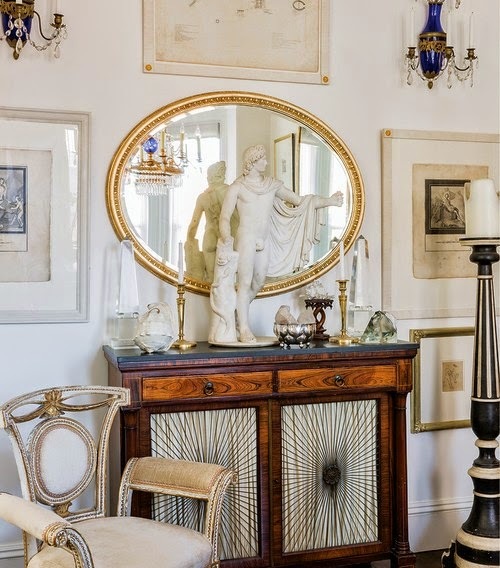 The gold tone of the chandelier compliments the gold frame of the mirror and frames of the art surrounding it. 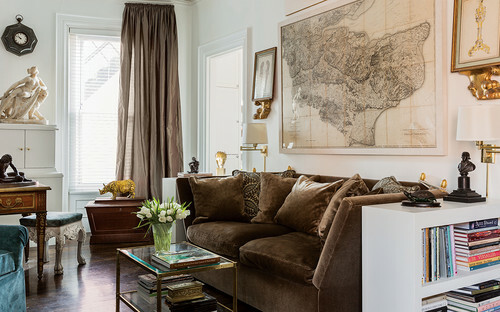 Materials throughout the apartment are mainly silk and velvet, luxurious, tactile fabrics that shout glamour. Sadly there are only a few images of this interior, however I hope you will find lots to inspire, it's the detail seen in pieces that fascinates me. I have to keep perusing these images as I spot a new gem such as the small detail on the corner of the frames in the first image. I like the interesting way the art has been hung around the rosewood sideboard, with some pieces hung very near floor level. When it comes to interior design, most definitely one should think out of the box and this apartment fits into this category, after all you want your home to be unique to you and a good designer should do just that. 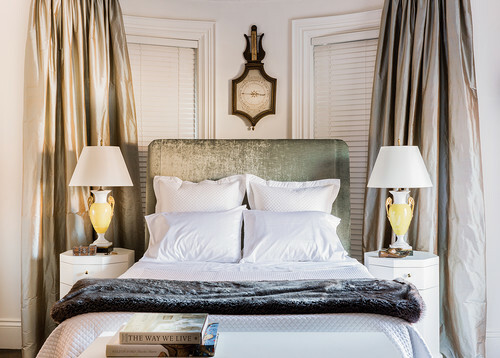 If you like this Boston based company's work, or interested in them helping you with a design, please visit their profile on Houzz for more information and further examples of their projects.